In 1995, one of Santa Cruz’s most successful competitive surfers, Chris “Gally” Gallagher-Stone, became the first Santa Cruz rider to crack what was then known as the “Top 44”: the World Championship Tour (WCT)’s revered annual list of the best surfers on the planet. He graced this prestigious list for three years, from ’95 to ’97. But, as he neared 30 years old, the constant travel lost its appeal and surfing began to feel like a job, and he decided to step away from competing. Over the past 15 years, Gallagher-Stone, who now resides on the North Shore of Oahu, has found a rewarding life after competitive surfing through coaching and shaping surfboards for the sport’s best. 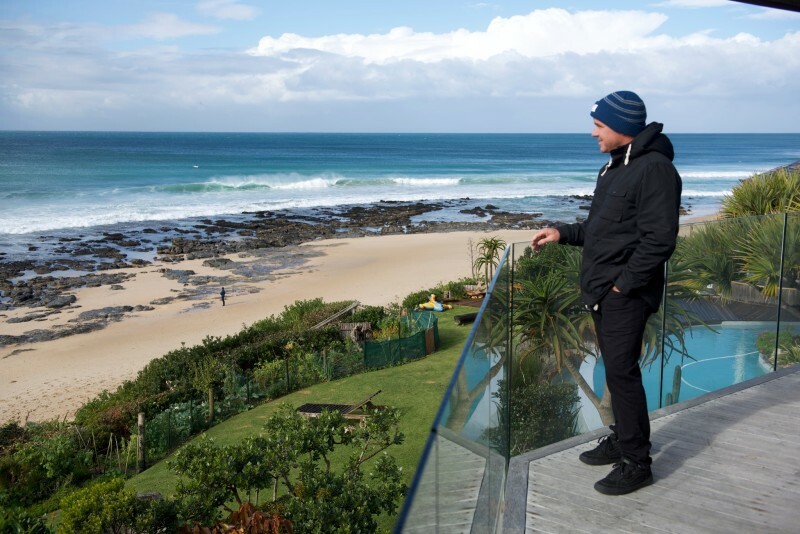 It’s a fitting path for a man who has been studying surf technique and coaching young surfers since he was a teenager. Seth Taylor, one the most polished goofyfooters to come out of Pleasure Point, grew up on 37th Avenue with Gallagher-Stone. Taylor remembers the elder screwfoot’s influence fondly, and can attest to his skill, even in those early days, for analyzing surfing. Hanging up the contest singlet at the turn of the millennium, Gallagher-Stone turned his focus to surfboard design, a facet of surfing that was precise and detail-oriented—just like good surfing. He began working with NHS, Inc. when they launched Santa Cruz Surfboards, lending insight that helped the brand with their mass-produced epoxy designs as well as custom polyurethane shapes for team riders including Bud Freitas and Austin Smith-Ford. After working with the Hobgoods for several years, as well as other tour standouts such as Taylor Knox and Josh Kerr, Gally was approached in 2016 by 29-year-old Jordy Smith, one of the sport’s greatest talents. Although reaching the elite WCT and being in contention for several world title races, Smith has never realized his dream of being world champ. Critics have previously found issue with Smith’s backside surfing, so who better to turn to then the backside master himself? And come they have. Their first year together, Smith placed as runner-up on the final rankings, and backed it up in 2017 with another impressive fourth place finish. Currently ranked fifth, with two events remaining on the docket for the 2018 season at the time of this writing, Smith is looking at another strong finish. The pair also worked on a board design that complements Gallagher-Stone’s coaching. 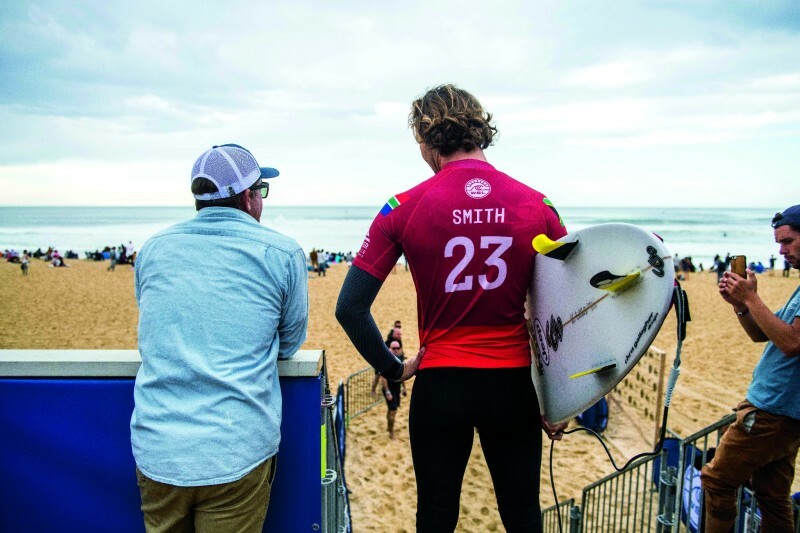 Even though Smith could ride any board from any shaper in the world, he has chosen to ride his coach’s boards during events. “To see one of the best surfers in history dismantle the ocean on one of my boards is pretty cool—[and] in an event, even cooler,” the teacher reflects. With surfing added to the 2020 Summer Olympics in Japan, it’s no surprise that Gallagher-Stone has been called on to lead the very first U.S. Olympic surf team. Given the position of “elite performance and technical coach,” he’s looking forward to working with the country’s top surfers and is in the process of developing the ideal protocol and set up to train this new breed of oceanic Olympians.